Solarthon, a solar installation block party and fundraiser is an annual event held by GRID Alternatives. It is a wonderful way for GRID staff and volunteers to get together and help a local community while also raising funds to continue the work that we do. This year’s Central Valley Solarthon was held in the farming community of Orange Cove, where we installed systems on the homes of eight low-income families’. This city of just under 10,000 residents lies 35 miles southeast of our Central Valley GRID Office in Fresno. We were fortunate to have Victor Lopez, the Mayor of Orange Cove come out and join us at the event. There are a number of reasons this location was chosen, but a crucial factor is our recent partnership with Orange Cove High School in our Solar Futures Program. By the time that we chose the City of Orange Cove as the site for our Solarthon, we had already held several installations with the students, and both students and staff have been enthusiastic about the experience. Stephanie Moreno, a high school Career Counselor, came out with seven students who were all eager to get started on their assigned house. Within this group of over 100 volunteers, staff, and special guests, there were eleven that came out with the Saechao family. Nien Saechao started volunteering with GRID Alternatives in early 2017, he was the volunteer that you can always depend on and with that dedication; he accrued several hundred volunteer hours. 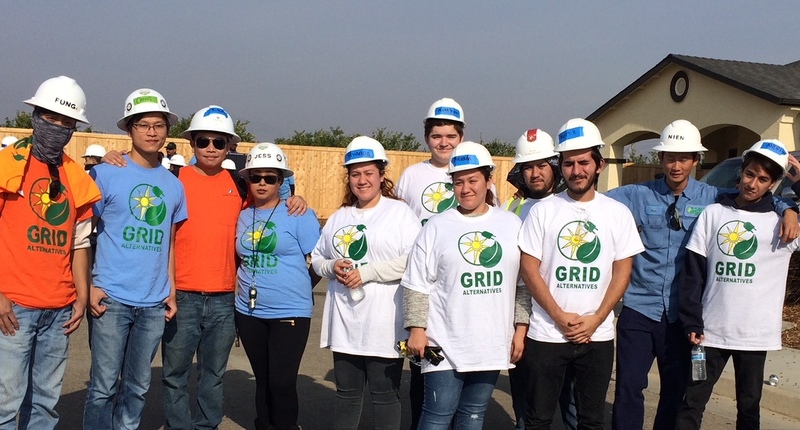 When a position became available at the Central Valley office, Nien applied for the SolarCorps Fellowship Program and now works in the construction office as a SolarCorps Construction Fellow. He loved the organization so much, he got his brother, Cheng Saechao and soon to be, sister-in-law, Jessica Madrigal to apply for SolarCorps positions as well. Cheng is now a Workforce/Volunteerism Fellow and Jessica is an Outreach Fellow. Nien also invited his friend, David Fung out to an install with him, and since then David has become a Team Leader with over 500 hours of service. On December 2nd, eleven members of the Saechao family and friends came out to Orange Cove to join in the Solarthon event. We are fortunate in the Central Valley for having such amazing staff and community members who want to give back. Without the help of everyone involved, Solarthon 2017 would not have been possible.